Some of the members of the police band performed at the Holy Temple Firstborn M.B.C. Prison Ministry Annual Holiday Program at 4960 N. 18th Street. The guest speaker was the Honorable Judge Derek Mosley. We are honored in 2019 to have Judge Mosley as our emcee of our annual concert too. The members of the Milwaukee Police Band performed at the Third Ward Christmas Tree Lighting Ceremony November 30, 2018. 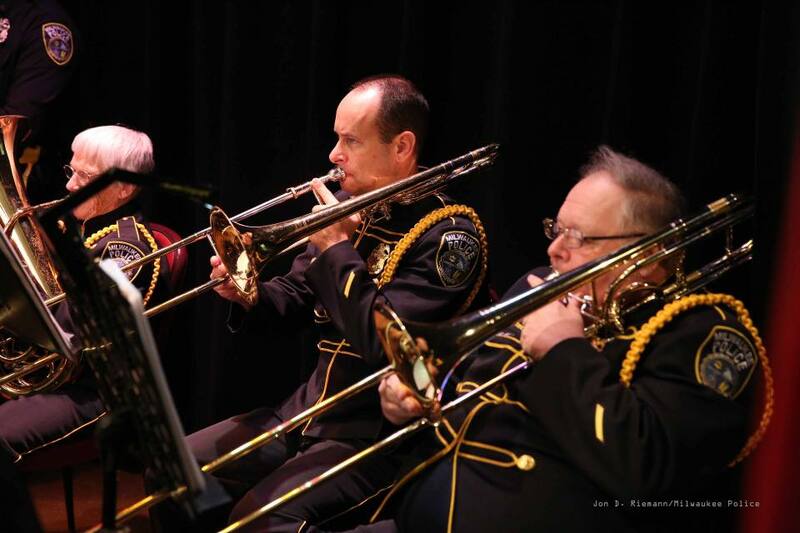 On November 14, 2018 the Milwaukee Police Band performed at the departments Merit Award ceremony. Among many other award recipients was a member of our band support staff, P.O. Michael Michalski, brother-in-law of Band Director Karen Dubis, who was posthumously awarded the Medal of Honor and Purple Valor Award. On July 25, 2018 P.O. Michalski was killed by the armed felon he was attempting to arrest. We will always remember you Mike. You’ll be in our hearts always. On November 9th, 2018 in honor of Veterans Day, members of the Milwaukee Police Band volunteered their time to participate in a special program at Willow Glen Elementary School for Veterans and their families. Retired P.O. James Hutchinson also performed Taps for the ceremony. 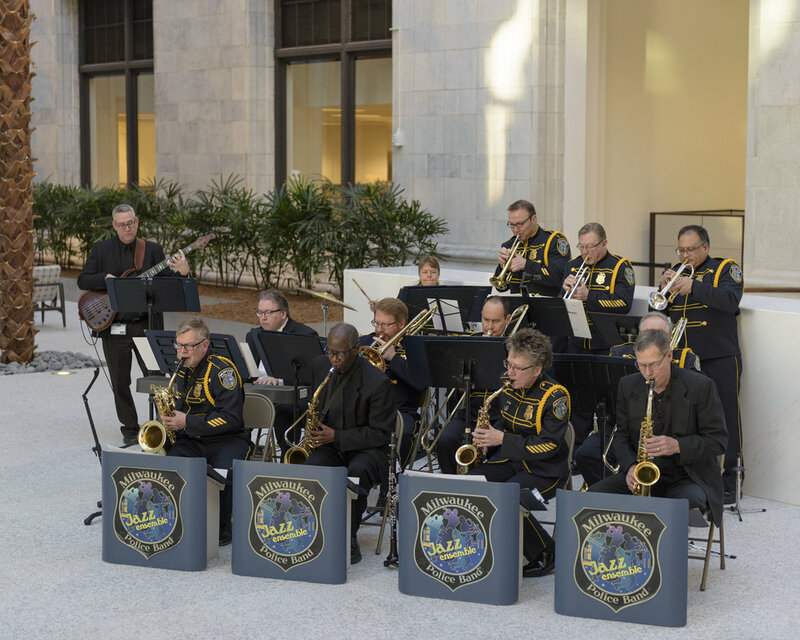 On October 12th, the Milwaukee Police Band Jazz Ensemble performed for the 45th Anniversary celebration of the Police band supporter Kelmann Restoration. On September 18, 2018, the police band members performed at the United Way Kickoff Campaign at Centennial Hall. The Milwaukee Police Band has been approved to receive donations through the United Way as our service to the community continues. On September 16th, 2018 the police band performed at Mitchell Airport for the Stars and Stripes Honor Flight upon their return back home to Milwaukee. What an incredible experience! September marked our 4th year of our elementary school program. The students of Messmer St. Rose Elementary School were awesome! Please visit our School Concert Page for additional performances in 2018. 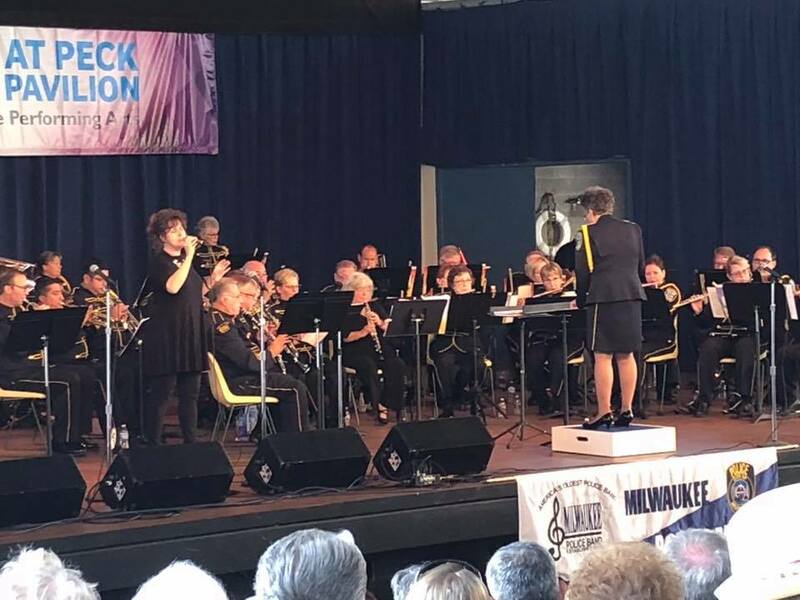 On Sunday, August 19, 2018 at 2:00 p.m. the Milwaukee Police Band performed for our summer concert Live at the Peck Pavilion. This free community concert brought with them their smiles and heart. We thank everyone who attended and hope to see you all at our next performance. Here are some of the highlights of our day. The Milwaukee Police Band participated in the Mass of Blessing on Tuesday, May 22, 2018. On May 5, 2018 the Milwaukee Police Band performed for the opening ceremonies of the Special Olympics at the Muskego High School. Pictured below is one of the Special Olympians that is also an honorary Milwaukee Police Band member and friend, Cathy. We are so proud to be a part of such a special event with such very special people. On Monday, February 26, 2018 the Milwaukee Police Jazz Ensemble performed for the State of the City speech by Mayor Tom Barrett. The ceremony was held at the Northwestern Mutual Life Building at 805 E. Mason Street. Hundreds of citizens were in attendance and the band played on. Our annual community concert on Saturday, February 3, 2018, 7:30 p.m. at the Pabst Theater was a celebration of our 120th Anniversary (1989-2018). Please enjoy a recap through photos and words of our performance. 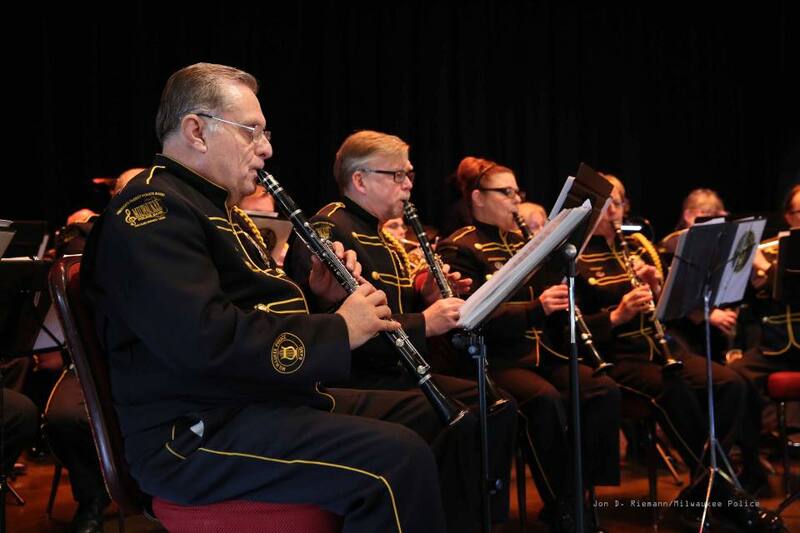 On Thursday, February 1, 2018 the Milwaukee Police Band performed at the Community Services Award Ceremony at the Wisconsin Club.